Still winter here so I thought a little bright color might cheer things up. And is there and color brighter or more cheerful than orange? The fur vest from So Many Styles has been in my closet for a while and now seemed the perfect time to bring it out. This is one of the cutest fur vests around and it comes in fantastic colors and a lot of them. The chunky shoes from Fashionboi Landar are the perfect bright shade to pair with the vest …they match the cord ties. Underneath is a really old vintage sweater from Gisaci but it still rocks. The gold muted color and the scooped neck work here (although it also has a beautiful draped, collar attachment that I am not wearing). I really like to use older pieces if they are still high quality and most everything I have from Armidi is. The other vintage thing I am wearing is my “&Bean” skin. The &Bean skins are no longer available but they have always been some of my favorites because of their strong look. The sheer slightly frilly tank top with the gold sequin trim is by Nylon Pinkney. Her hand-painted items are always wonderful…lots of style, imagination and fun! I really like that you can see the high-waist of the leopard jeans/tights (R.icielli) under it. 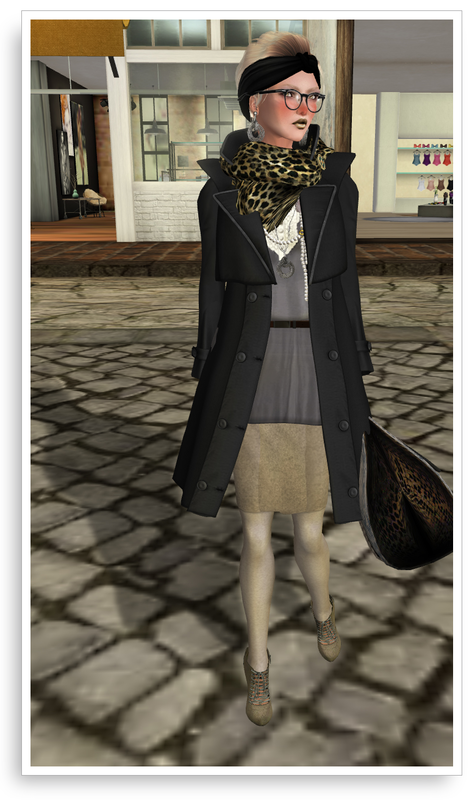 I am a big fan of hats, I have been since I joined SL but wow… they have really come a long way. When I found this wonderful hat from Georgyna (LaGyo) it was instant love and the start of this look. Soft and beautifully shaped it comes in many simply gorgeous colors and you can change the color of the button and string band with a built-in script. I added from Mon Tissue a great all around suede jacket. Love the way it cinches in at the waist and then flounces out. The pumps are also from Mon Tissue and the are the perfect little heel for a sporty look. The cropped pants—a length I love in RL as well—are from Willow. They are a huge favorite of mine right now. I found an old favorite in my scarf drawer from Artilleri. It’s a classic, one of the first scarfs I ever bought and I still love it. I don’t know why I needed a briefcase for looking at pumpkins but it is cute. And the little shoulder purse is TokiDoki, a real ❤ with its embroidered flowers on the flap. 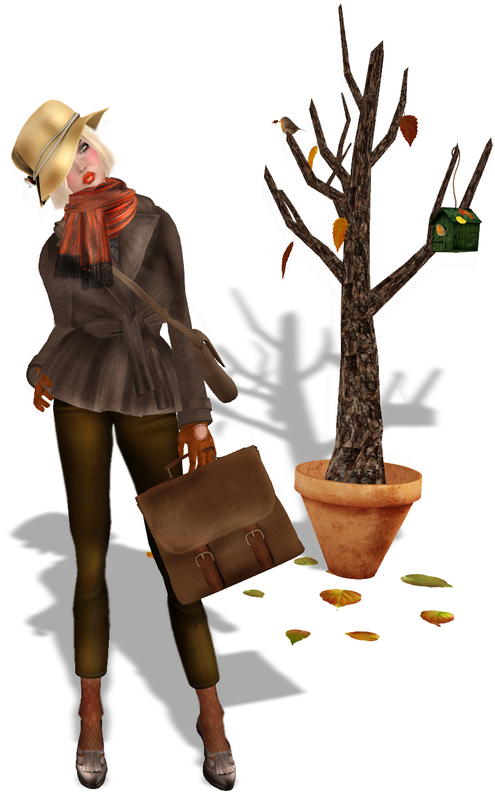 In the winter season sunny days seldom come along in rl but here in our pixel world they are easy to come by. So when the snow is falling outside my rl window it is great to escape and enjoy the sunshine on the grid. For my day in the sun I’m wearing one of Mon Tissu’s mesh pencil skirts. Beautiful textures and lots ! of colors available. The grey top is also Mon Tissu —I love that it is long and you can wear it outside your skirt…it even has its own little belt. The top is really versatile and a little boho, it looks great on its own with just a pair of tights or jeans. The coat is a two-tiered, almost-military style from Lelutka …. I love the way it hangs open and looks so natural. The bag from LaGyo is really one of my favs this year, it adds lots of style with its huge size and great crocodile texture. It comes with a nice pose or two which is important for handbags unless you have an AO that can accommodate the bag-holding without the handbag ending up inside your body or over your head. Can’t stop without mentioning the hair from vive9…LOVE the wrap style (very chic) and the little wisps of hair escaping from the wrap. I absolutely ❤ the lace-up boots from JySyLilO. A great heel and the laces and zippers add an edgy quality. More details and landmarks after the cut. Now get out in the sunshine, even if it is pixel sunshine. I adore Anya Ohmai’s darling little “fox” stole. And yes…it is faux fur (and of course it is faux, faux fur being pixels and all). She has done an amazing job with this piece….and I love the retro-ness of it. I am wearing it with some fabulous mesh items from Celoe. These pants are just wonderful. Love the shape, the texture, the shading and since they are mesh is is so cool to be able to sit in them and they actually still look like pants! The jacket is also Celoe…once again great technical work with the shape and artistic work with the textures and if either of these were available in rl I would be adding them to my closet. The travel bag is from Mon Tissue—shown here in camel but it comes in other super fun colors so you can always travel in style. The off-white handbag is from Orta. I added some favorite “oldies” to the mix including Dango’s beret by Azure Electricteeth, the fun Fly Earrings by Polyester Partridge, Paper Couture’s huge Moon Ring and LaGyo’s gorgeous bracelets.